You can’t go wrong Adding Blush to Your Capsule Wardrobe or if blush isn’t your thing, any other color will work! Last week, I talked about choosing an accent color for your capsule wardrobe. 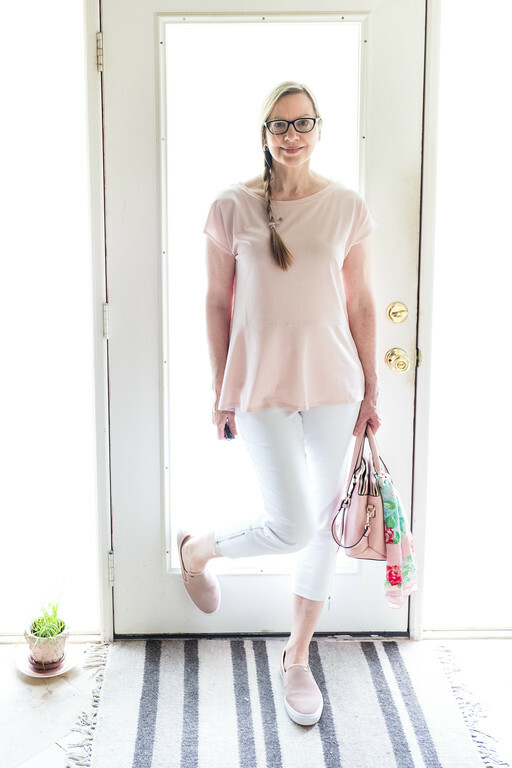 My capsule wardrobe didn’t call for an accent color, but when I found a blush peplum top instead of the white one that I was looking for, I stumbled upon my accent color. Since it is a solid color and almost a neutral itself, it easily subs into my wardrobe instead of the white peplum. Are you one of those people that switches out your purse with your outfit? I admire you. Sometimes it’s all I can do to remember to put on some simple hoop earrings. Accessories are not my strong point. So, I have one winter purse and one summer purse. 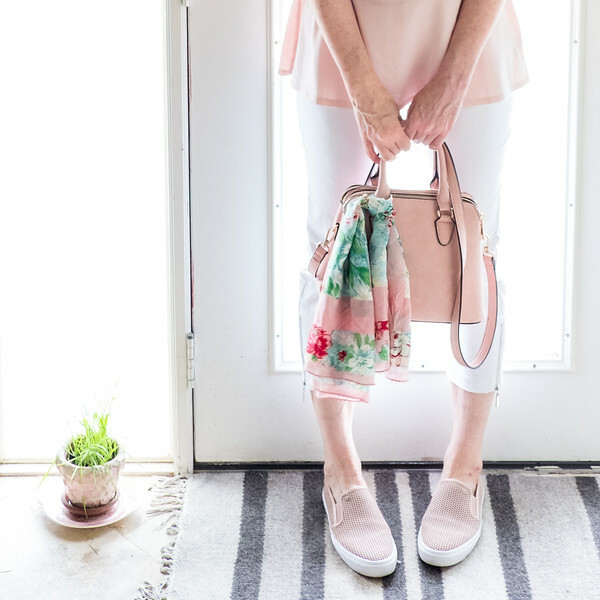 My summer purse this year is a soft pink purse that I found at TJ Maxx – some others that I love – Blush Tote Bag, Blush Clutch, and Chevron Quilted. My scarf is a vintage one that I picked up at an estate sale many years ago, I love it’s soft pink and blue color scheme. Scarves are the only accessory that I use with confidence, some others that I love – Blue Eiffle Tower Scarf, Violet De Mar Babylon Pink Scarf, and Jimmy Choo Floral Print. But my favorite part of the outfit are the blush pink Michael Kors Boerum slip ons!! Aren’t they perfect?! 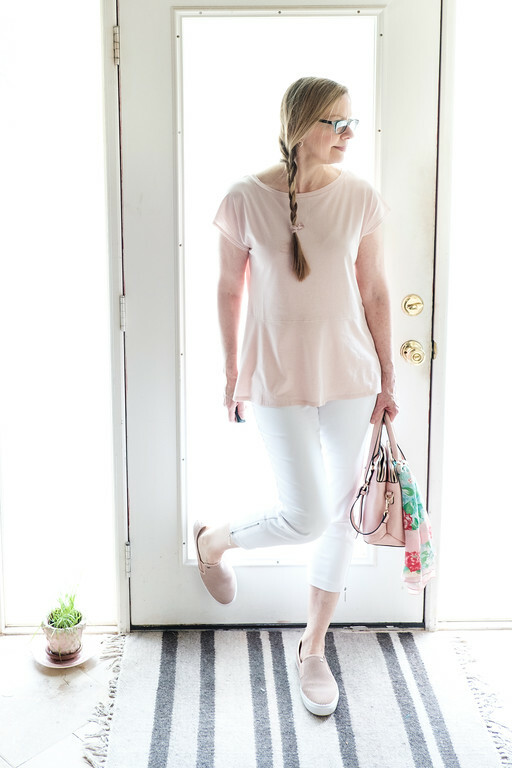 They are super comfortable and the soft blush color makes them a neutral just like the top. These Steve Madden are very similar and I love these Court Sneakers! So, there you have an easy take on my summer wardrobe capsule. To recap, the top is Jones of New York and the shoes are Michael Kors both found at Marshalls. The white skinnes are premise found at Steinmart. The pink purse was found at TJ Maxx. Beautiful outfit. Love the blush color on you and the accessories! Love this outfit, Pam. The blush is the perfect accent to your French minimalist style. I always love incorporating blush! I love that it looks wonderful with black, brown, and gray tones, so it’s very flexible. Blush is one of my favorite shades right now! I love your bag and scarf! This is such a cute outfit! Blush is such a pretty and versatile colour. It looks great paired with white in Summer. I love how you’ve tied the scarf to your bag. Thanks for linking up!